I felt like showing some of the custom models that I've made recently. Feel free to reply with your own customs or questions about mine. The teal truck behind S.C.Ruffey. Some of the Wiki writers are convinced that this is Rickety. 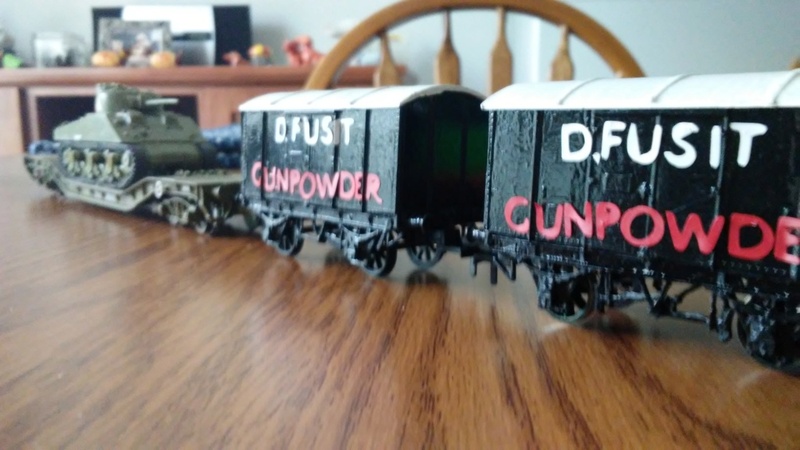 "Oliver's no use at all..."
I also made the non-express main line coaches from season 1. 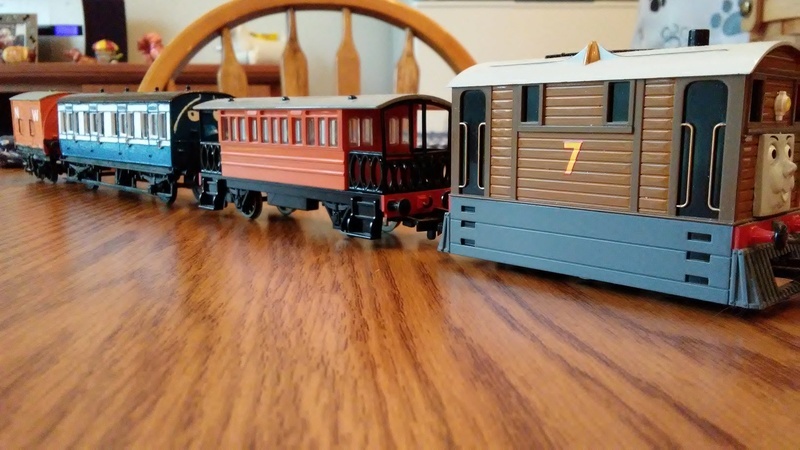 These had an ERTL release as "Old Coaches." 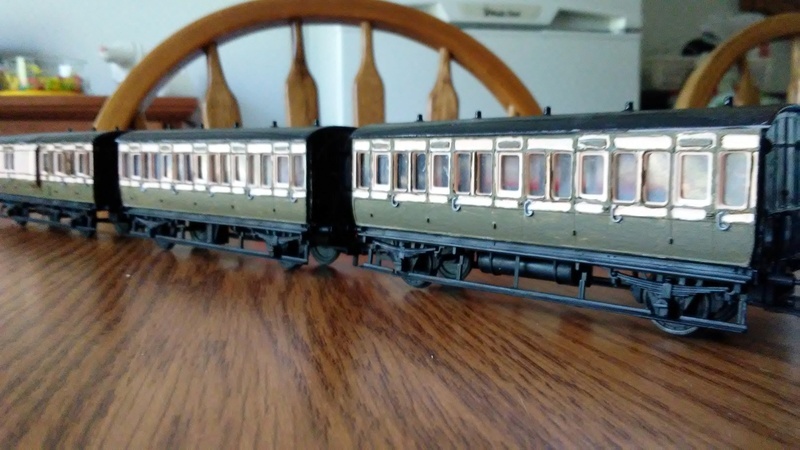 I didn't realize until after buying a brake coach kit that the brake coach in the TV series looks like a composite coach that was painted like a brake coach (kind of like Emily's coaches). Oh Well. Well done on those customs! 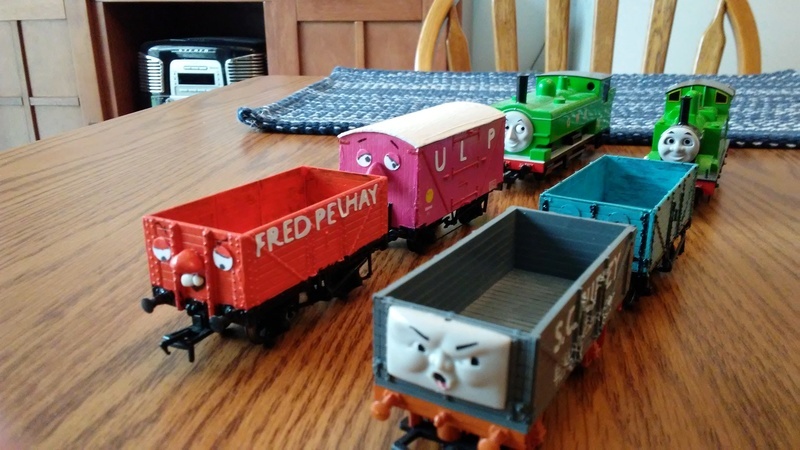 And since you made Fred Pelhay and Rickety, apparently the models of the Cargo Car and Blue Open Wagon were supposed to be those characters, and then they were cancelled. Has anybody ever modified any of the old Hornby clockwork versions of the Tidmouth Milk tanker to make it say TAR or something else? 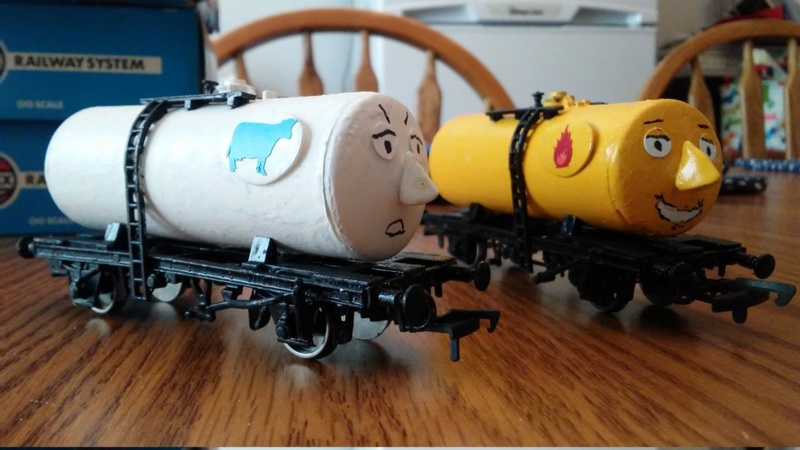 Also, don’t you find it to be just a big bummer that Hornby never went beyond Shell and Tidmouth Milk when they did their Hornby clockwork range? Here is my latest: Victoria from the penultimate book of the RWS (as extended by Christopher Awdry). I haven't decided on the order since Elsie and Victoria have never been depicted together. I've seen old photos of the Wisbech luggage van directly behind the tram, but not having Henrietta first seems odd. What book chapter it is in? I can't seem to remember that when I reading. I do have the complete book series. Victoria is in the book, Thomas and Victoria (the book has little to do with Thomas, but his name was put on most of Christopher Awdry's books for the sake of name recognition). Christopher Awdry's books are typically left out of RWS sets, and if you do have the Christopher Awdry collection, I believe that was actually published before Thomas and Victoria. 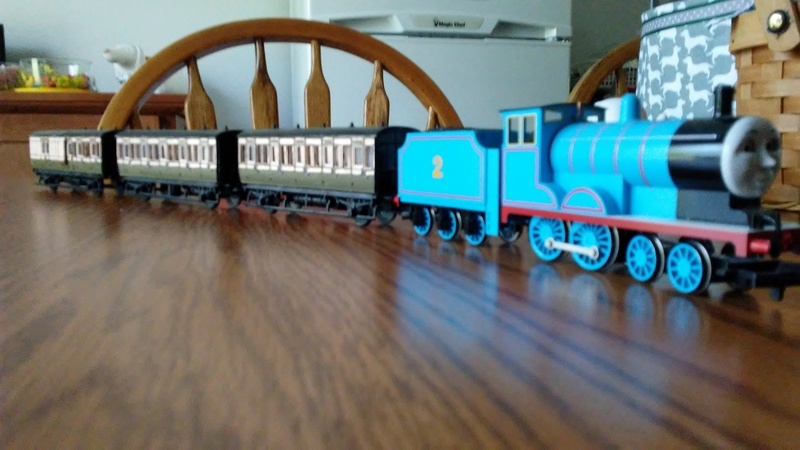 She was added to Toby's train because Henrietta was becoming overcrowded and passengers were riding on her verandas, causing Toby to get in trouble with the police, much like Thomas before him. 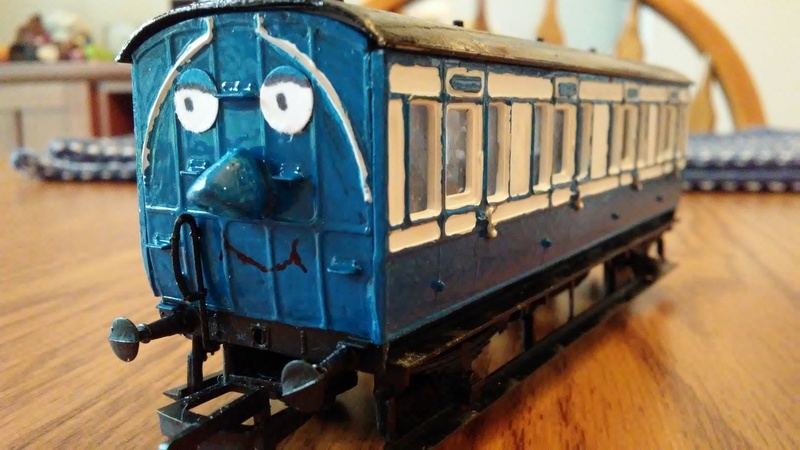 She is a former Furness Railway coach, which is why she is blue and white instead of orange like the other Ffarquhar branchline coaches. Thanks for that wonderful information. I'll look to see about the new stories from Christopher. 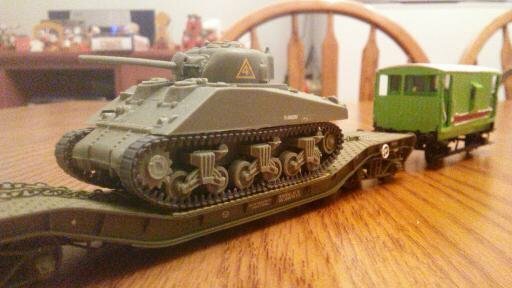 Nice Fred model, mate. Your timing's decent; I made this version just a couple months ago. Nice job with the face on your Fred. Did you mold it yourself? 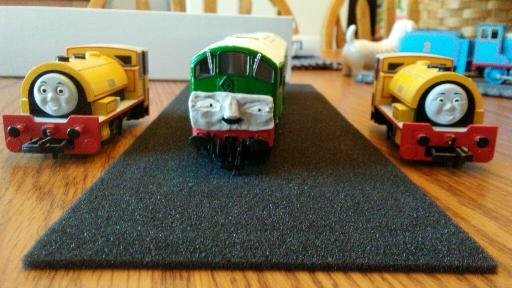 I've been making the faces on mine with paper eyes like Annie and Clarabel and the season 1 trucks. 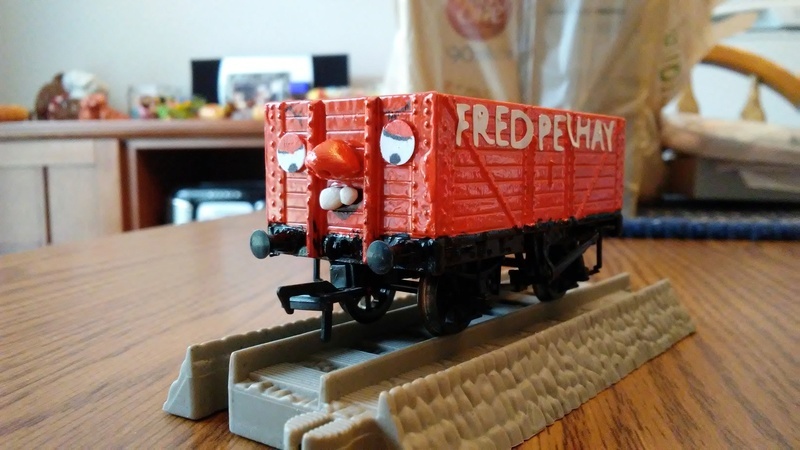 The large brackets on both ends of the 8 plank wagon (I followed the wiki that he is based on a fixed end 8-plank wagon) that I used to make Fred wound up making the face pretty difficult to apply. Making him dirty with coal dust was also a nice touch. 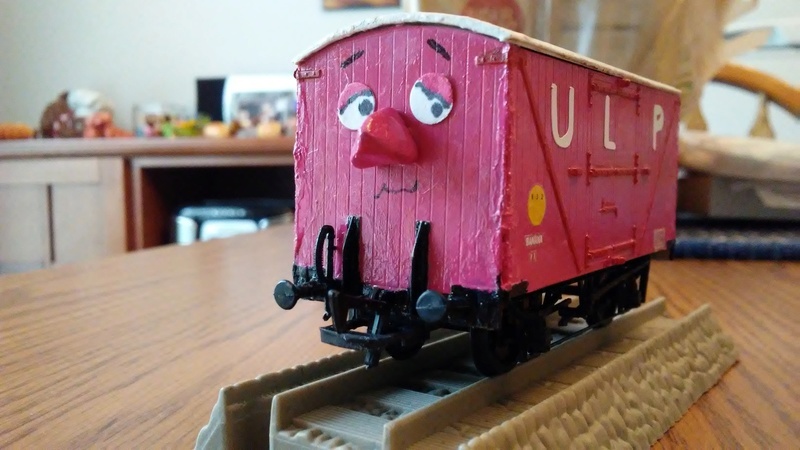 It took me a minute, but I can see that he repainted S.C.Ruffy's face, if not an entire S.C.Ruffey wagon. 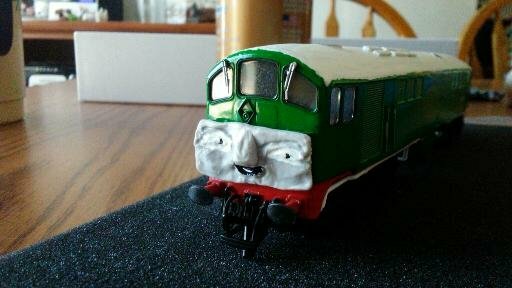 It is indeed just a S.C. Ruffey model; never cared for Bachmann's lazily-made version of the character and decided to repurpose him for this. I knew that there was something familiar about the face. Well he really surprised me! I didn't notice it was the same car, but it was very detailed change of the mouth and eyebrows. I checked Christopher's books. I don't have any of his works. I was surprised that some of the stories went into the live action. It's been a while since I posted anything in here. I haven't done much that's terribly exciting, so I'm putting all of my new creations together. 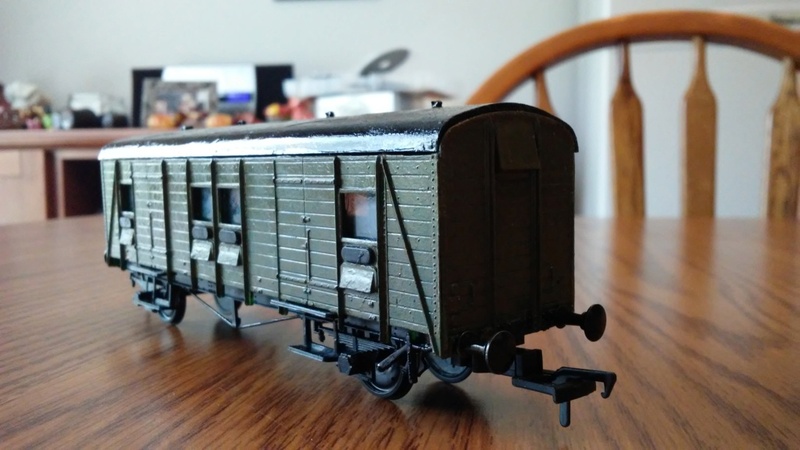 First is a parcels van to match the old coaches. 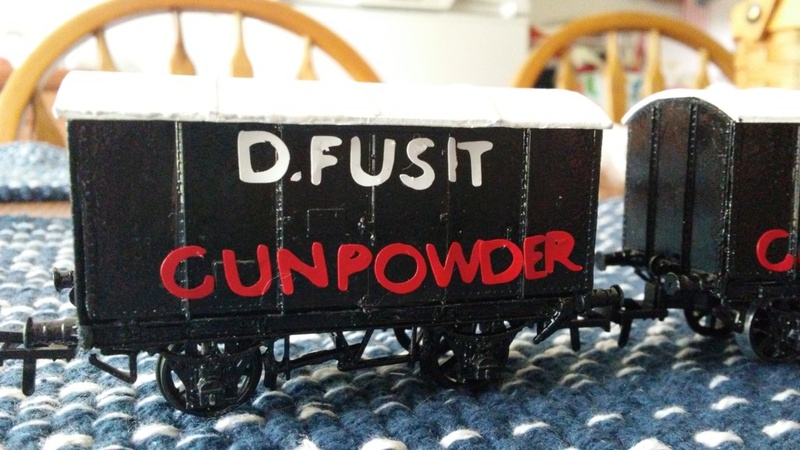 Next is my take on a standard gauge D.Fusit wagon, built using GWR gunpowder wagon kits. Lastly are some RWS style Troublesome Tankers. I chose the kit that I used because there were no braces on the tank ends. 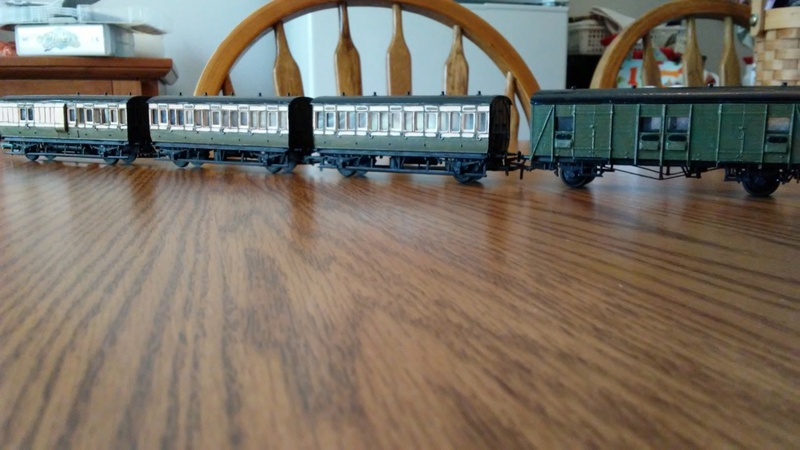 My next project will be some slight alterations on the new autocoaches that I mention in the "New Acquisitions" thread. 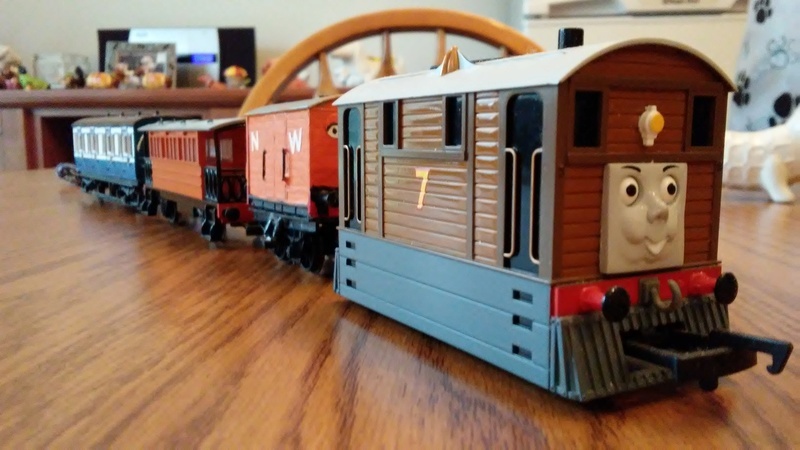 After that, I have some narrow gauge projects in the works. I haven't been on in a while, but I swung by to check the 2019 announcements. 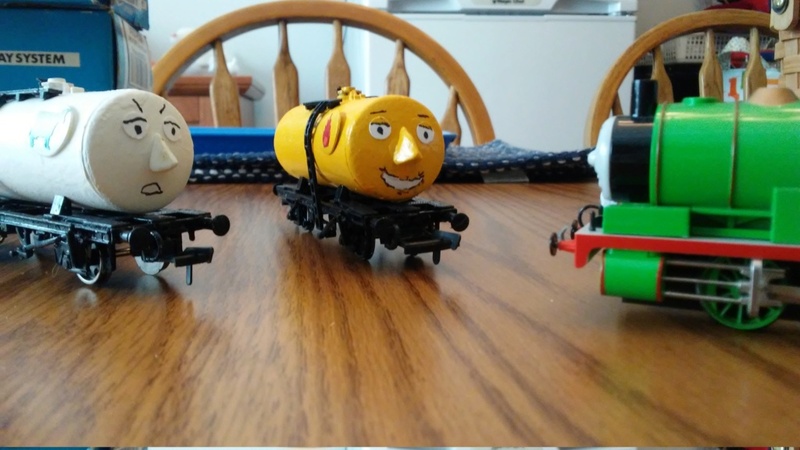 I decided to post my models of BoCo and Bradford while I was here. 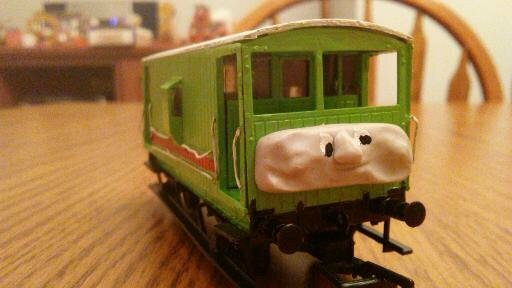 I went ahead and made BoCo because I'm fairly confident that Bachmann will never make him. 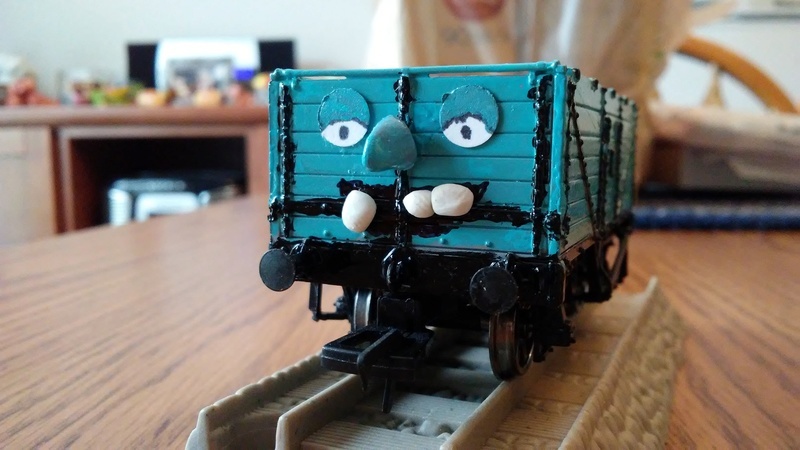 I was originally going to make a generic break van using Bradford's kit, but I decided to go ahead and make Bradford because I though he would work with my war well wagon personality wise. The face could be better, but I'm pretty new at it. He still needs decals, but they were out of stock last I looked. CGI faces are even harder to use as a guide because they're so smooth, they don't really have "landmarks." Also, working with the wire and drilling the holes to make the handrails on this kit was a nightmare.